Du du DUH! Finally kiddos, it's a reality! Priority for the week: Get downtown for the most delicious gluten-, soy-, egg-, and dairy-free baked goods you've ever tasted! 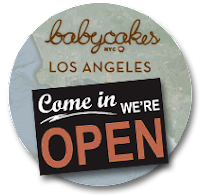 BabyCakes is adding donuts to the mix here in LA (toasted coconut, chocolate dipped, and cinnamon sugar..) to shine alongside NYC favorites, their world-class cupcakes, cookie sandwiches, crumb cakes, brownies, macaroons and of course frosting shots! All guilt-free thanks to holistic ingredients like coconut oil, flax, and agave nectar. Thank you Erin McKenna! LA ♥ you!